Note: The 2014 tour was a huge success and the 2015 tour is now scheduled from July 9-22. Please email rick@ghostarmy for more info. We gathered that first evening at the Regency Hotel in London, thirty-three intrepid travelers in search of history. We introduced ourselves over drinks, each of us wondering what the next 12 days would have in store. I can honestly say that, even after a year of planning, Marilyn and I had no idea how magical it would prove to be. 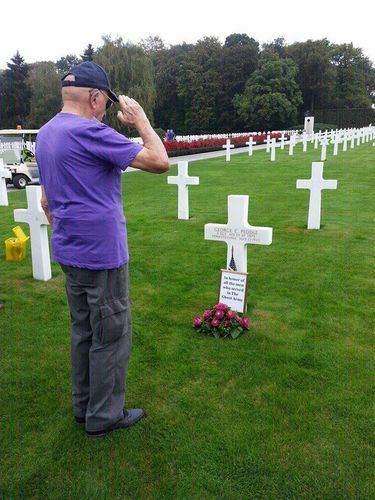 One thing that made it special was the presence of ninety-two year old Ghost Army veteran Gazo Nemeth on his first trip to Europe since the war. He spun stories of his wartime experience at every stop. There were also eleven family members of Ghost Army veterans, who shared stories and scrapbooks. Their presence gave us a powerful personal connection to the Ghost Army story as we trekked across Europe. Those 12 days were full and rich. The time and miles flew by as we visited nearly 40 sites, each one more amazing than the last. Here are a few highlights. 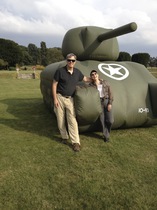 Blowing up a rubber tank at Walton Hall for the first time in 70 years was one of the most memorable moments. The 19th century manor house that was home to The Ghost Army before they went into Normandy is now a hotel, so we ”bivouacked” here just as they did. There was plenty of opportunity to stroll the enchanting grounds and imagine them covered with the tents of the deceivers. 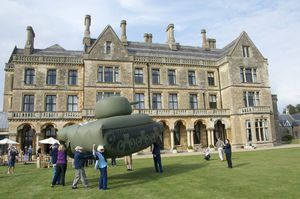 The camouflage unit began working with inflatable tanks here, and we had great fun inflating our replica dummy tank on the manicured lawn. Well, some of us took part inflating it – others sat on the veranda drinking Old Speckled Hen and snapping photos! As the tank took shape, Rick talked about how the original ones were designed and constructed. What a thrill to experience doing what the Ghost Army soldiers did in the very same place. 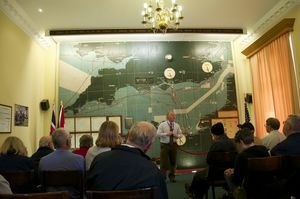 This was General Eisenhower’s headquarters in the days leading up to D-Day. The great wall map showing every particular of the invasion has been meticulously preserved. Now an officers’ mess on a British Army base, this is definitely off the beaten track, but you could almost feel the presence of Ike, de Gaulle, and Churchill taking part in the momentous decisions made here. Retired British Army colonel Jeremy Green painted a vivid picture in a talk that was as entertaining as it was insightful. His passion and knowledge swept us away. Arriving in the Normandy village of Trévières, Mayor Jean-Pierre Richard greeted us like celebrities, and then escorted us to the bombed-out church (now restored) that so many Ghost Army artists painted in 1944. We were brought to tears when we learned that one of the members of the town delegation was the brother of a young boy painted by Ghost Army artist John Hapgood! 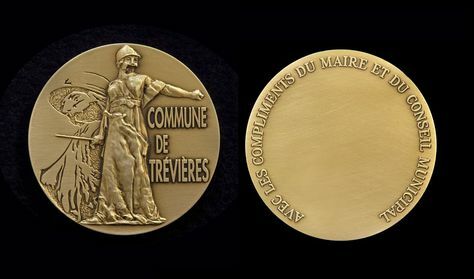 Mayor Richard presented a medal to commemorate the unit’s efforts, and to thank us for illuminating this hitherto unknown piece of the town’s history. We presented the mayor with a reproduction of Arthur Singer’s evocative watercolor of the church that will hang in the town hall. Our friend Jacques Fourcade, who had organized the morning’s ceremony, introduced us to Marie-France Benoist. Her family home on Omaha Beach is one of the few houses there that survived the invasion. It was used by the Germans as an officers’ billet, and by the Americans as a field hospital. Years later, an American veteran told her that he went down into the basement looking for wine and discovered a German time bomb there. (Thus proving the unexpected health benefits of wine.) She invited us to visit her house - and we accepted! It was a unique experience to walk through her gardens, just steps from where the most desperate fighting took place, and hear about her family’s experiences during invasion-Day and its aftermath. Everywhere in Normandy we saw signs celebrating the 70th anniversary of D-Day and welcoming the liberators’ return. We were touched by the gratitude directed towards the United States from Mayor Richard, Marie-France, and many others who we met. The seminary that was home to the camouflage and radio units is now a part of the University of Luxembourg, which invited us in and hosted a reception just outside the room where Marlene Dietrich performed for the men on November 20, 1944. Gazo also showed us the room where bunked. We walked in and surprised a few students, whose bewilderment turned to fascination when they learned the story. We also did a walking tour of The Grund, the oldest and most beautiful part of Luxembourg City, visiting many of the spots where artists in the unit painted and sketched. Later that day, we traveled through all the towns that were part Operation KOBLENZ, the deception mission along the German border that immediately preceded the battle of the Bulge. Fascinating to see first-hand how much territory was involved in just one of their 21 deceptions. The most emotional moment of the tour. We came to visit the grave of Staff Sergeant George Peddle, one of the handful of Ghost Army soldiers killed in Europe. Gazo Nemeth knew him well, and as we laid flowers by the headstone, Gazo haltingly remembered his friend. Then he turned to salute his fallen comrade. There were hugs all around, and not a dry eye among us. Among the five thousand-plus Americans buried here is General George S. Patton. We paused at his grave and then visited the nearby German military cemetery as well. Earlier in the trip we heard it said that “the British celebrate their dead, the Americans honor their dead, and the Germans mourn their dead.” The German cemetery’s somber, gothic feel is so different from the rows of gleaming white crosses in its American counterpart. We had a fantastic day in and around Bastogne, Belgium, a pivot point in the Battle of the Bulge. 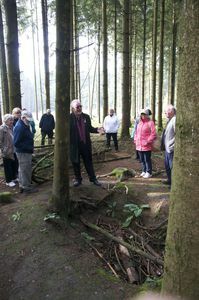 Historian Martin King gave us an insider's tour of the battlefield, taking us into the forest to see foxholes used by the Company E of he 506th Parachute Infantry Regiment, (The Band of Brothers,) leading us to a Panzer tank left behind by the Germans, and much more. Martin mesmerized us with stories of little known heroes. We stopped at the Bastogne Barracks, headquarters of the 101st Airborne during the battle. It was here that General Anthony McAuliffe responded to a German surrender demand with a single word: “Nuts!” The Belgian soldiers working hard to restore it have done a standout job. Especially impressive were the dozens of restored WWII vehicles. Several family members of soldiers from the sonic deception unit climbed into a halftrack just like the ones their fathers and grandfathers used! 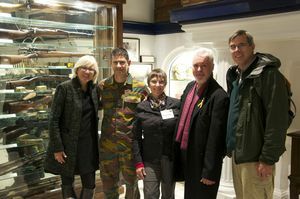 Helen Patton, granddaughter of General George Patton and a good friend of the Ghost Army, hosted us for lunch at the 101st Airborne Museum. She served up chili she made with the Patton family recipe – which includes coffee and chocolate! Helen urged us to visit this museum, and it was a gem. Most memorable bit: a subterranean multi-media show in which visitors experience what it was like for townspeople sheltering from German artillery and bombers during the siege of Bastogne. It was chilling. Bletchley Park: the huts and blockhouses where thousands toiled to decipher, read, and analyze the Germans’ coded radio messages. Pegasus Bridge: site of the first action on D-Day, a dramatic British glider attack that took place a few minutes after midnight. The Surrender Museum in Reims: The room where the Germans surrendered to Eisenhower has been carefully preserved exactly as it was on that fateful day. 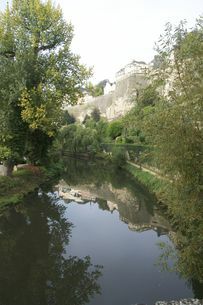 And the side trips…Stratford-Upon-Avon, Oxford, the Bayeux Tapestry, Giverny, Notre Dame Cathedral in Reims… dizzying! The day after the tour ended, Marilyn and I attended a screening of The Ghost Army documentary in Wiesbaden, Germany. We had seen the film unfold hundreds of times before, but now we saw it with new eyes. It felt more intense, so much more personal. That is just part of the powerful effect the trip had on us. We are grateful to Tour Director Brian Kruse ("The Kruse Missile") and driver Lucien Hilvering, who both contributed so much; to all the people from England to Germany who welcomed us, shared their experiences, and made this journey unique; and to everyone on the tour for their enthusiasm, energy and insights. 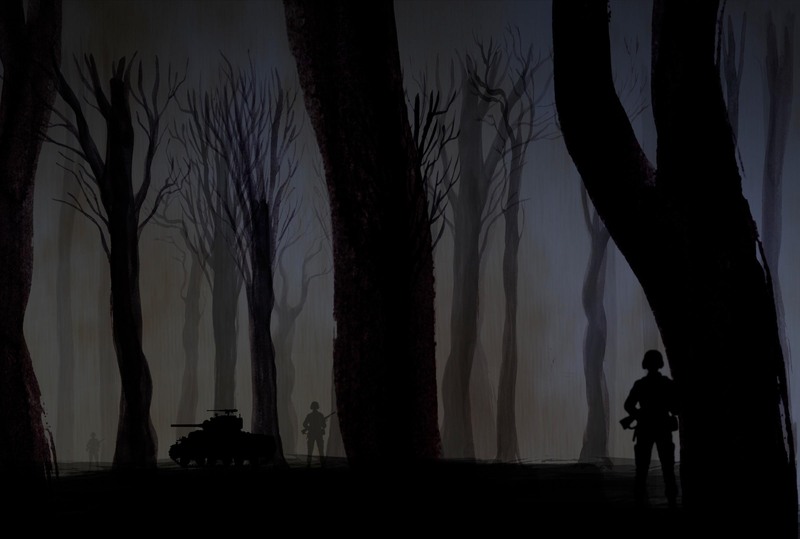 We have already begun talking to Stephen Ambrose Historical Tours about the 2015 Ghost Army/Secret War Tour, filled with excitement about the opportunity to go there again, secure in the knowledge that there is more to experience and discover. You can see more photos from the trip here and follow us on The Ghost Army Facebook page. WWII Veteran Tells a Ghost Story.